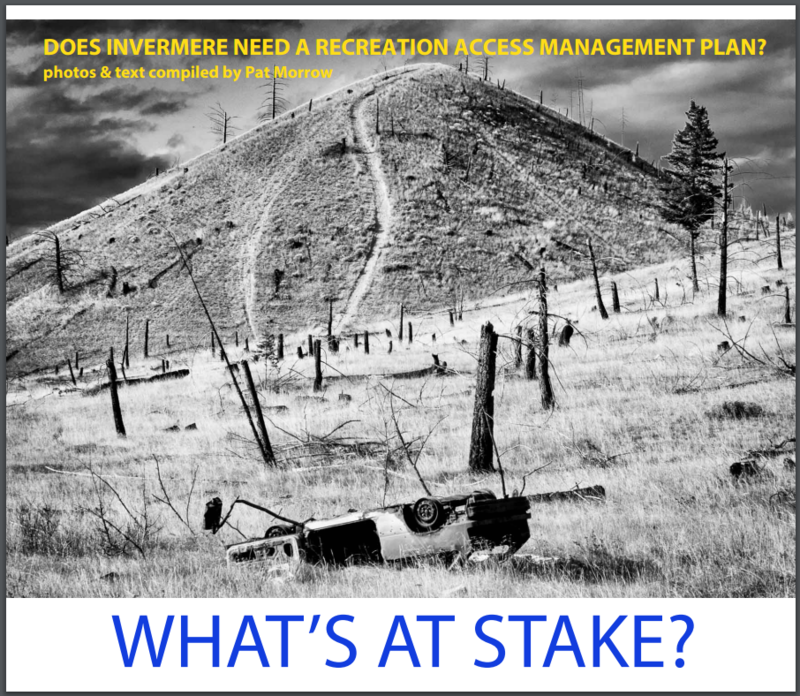 Does Invermere need a recreation access management plan? Does it matter how many trails there are in the backcountry? What can we do to ensure nature is left intact for future generations? Pat Morrow has assembled a collection of photos of environmental degradation caused by motorized recreation right in our backyard, volunteer cleanups of the mess, and examples of what it means to responsibly and respectfully move through the front and backcountry. Protecting our mountains and valleys for wildlife, clean water and wilderness for future generations means changing the way we access and enjoy our backcountry. Our current destructive recreation patterns simply can’t continue! Invermere is the only area in the Kootenays that does not have a formalized access management plan. For years, concerned citizens in the Invermere area have been advocating for a plan that would balance the ecological values of the land with tourism and recreation.